Ring Wars Carolina: Upcoming Event: "20 years in the Making" RWC 20 year Anniversary! Upcoming Event: "20 years in the Making" RWC 20 year Anniversary! As we all know by now, things happen overnite. But, 20 years ago Ring Wars Carolina put on their first show to the public. They have not looked back since then, as we can tell, now. One of the oldest bodies in NC and still kicking out great family entertainment, time and time again. Aug. 4, 2018 will be another step in the right direction. RWC will present "The 20th Anniversary" event in Lumberton NC @ Priscilla King Arena located on 612 2nd street. You will see The New Ring Wars Carolina Tag Team Champions, Airtime Rockers defend the titles against Vicious & Delicious. The new RWC No Limitz Champion, Drew Thomas will defend his fresh won crown against the winner of a 5 man gauntlet match. The return of female action and Dani fererra as she takes on Lynzee Pike. You will see the NEW RWC 4 County Champion & Heavyweight Champion Nite-Stic Eddie Brown, sit down at the Poker table with "The Gambler" Chance lebeaux. 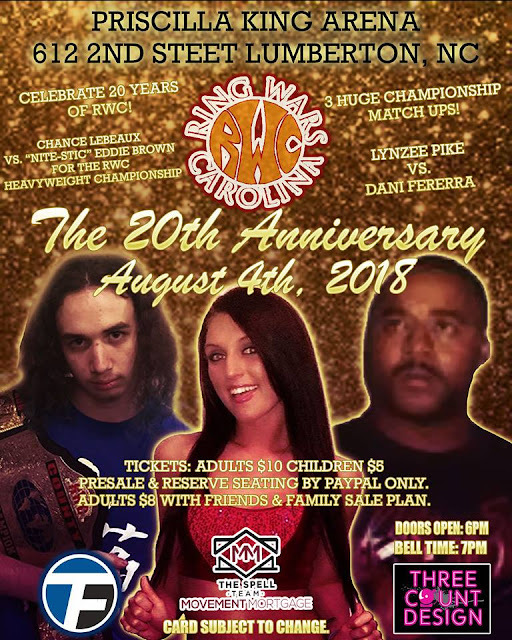 Hangtyme, Joseph Everhart and more RWC Superstars on The 20th Anniversary of Ring Wars Carolina! When is this action taking place with family entertainment? Aug. 4, 2018 will be another step in the right direction. RWC will present "The 20th Anniversary" event in Lumberton NC @ Priscilla King Arena located on 612 2nd street. ***If you want to get a discount on your tickets, you must prepay by PayPal/rwcoffice@hotmail.com with The friends & family option only! Make sure you put the names of the ticket holders in the note section. This will guarantee you 1st dibs on seating and $2 off the regular adult ticket only! Example 2 adults, 2 kids. Regular price is $30, discounted price is $26 plus first choice at front row seating! Get your tickets early cause these are 1st come, 1st serve & limited amount! Aug. 4, 2018 will be another step in the right direction. RWC will present "The 20th Anniversary" event in Lumberton NC @ Priscilla King Arena located on 612 2nd street.